33ºSouth is a three-channel audio-visual installation that juxtaposes the cities of Sydney (Australia) and Santiago (Chile) using a custom made data mapping system and database. 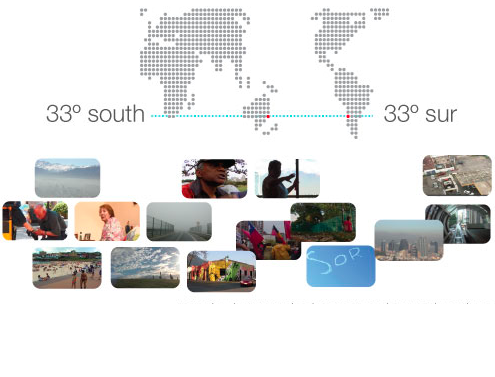 Both cities lie on parallel 33ºSouth, and are post-colonial urban spaces with complex cultural and political histories. This project aims to set in motion a set of relationships between these apparently unrelated urban spaces by collapsing their histories and geographies into a different imaginary and virtual place with its own cultural narratives. Exhibited at Casula Powerhouse Arts Centre, NSW in 2009. 33ºSouth explores the cultural, economic and environmental politics of juxtaposing two urban spaces into a heterotopic space. Heterotopii are displaced/dislocated spaces. In Michel Foucault’s use of the concept, heterotopii are places and spaces that function in non-hegemonic conditions. These are spaces of otherness, which are neither here nor there, that are simultaneously physical and mental. Unlike utopic or dystopic spaces, heterotopii have complex and fuzzy layers of meaning and relationships, which we use in order to think about the contemporary emergence of difference, class and identity as core issues in the histories/geographies of Sydney and Santiago. This project was a collaboration between new media artist, Sarah Waterson and media anthropologist/videomaker Juan Francisco Salazar. MaxMSP programming by Jon Drummond. This first iteration of 33ºSouth comprises three large video screens and a generative system. Two screens with video footage shot by the artists in Santiago and Sydney between 2007/2008 are set in opposition. Each video is 33 minutes, 54 seconds and 15 frames long, coinciding with the geospatial location of Casula Powerhouse (33°56’56″S). In the third (central) screen, video footage from both locations is reframed and composited by the database system using live data from both places. One set of data is made up of local air pollution levels in Santiago and water quality in Sydney, which are used to drive and compose the live video installation. The other set is the historical data of the Southern Oscillation Index (El Niño and La Niña phenomena) that affect the coasts of Australia and Chile in irregular and intermittent patterns. These are tracked as global weather enters the video space to select the video display based on meta-tags. The audience is invited to create a mental map of the superimposition of both locales and the system creates a heterotopic visual and sound scape by combining and recombining meta-data flows.